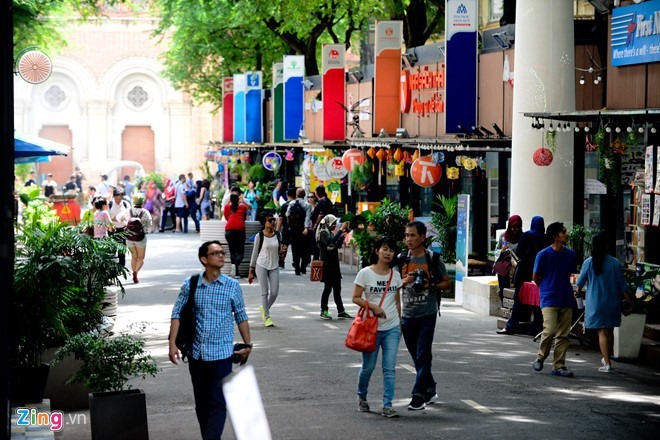 HCM CITY — The HCM City Book Street on Nguyễn Văn Bình Street in District 1 has earned more than VNĐ105.7 billion (US$4.5 million) from its book and cafe sales since it opened three years ago, according to the HCM City Book Street Company. More than 2 million books on different topics were sold during the period. The street earned turnover of VNĐ20 billion ($877,000) in the first six months of 2018, up 5 per cent annually. In 2017, turnover was VNĐ50 billion ($2.2 million), and the number of visitors were 2.4 million. To celebrate its third year, the street has opened a new entertainment place for children that offers activities related to traffic education. The book street, which opened in January 2016, features dozens of book stalls from more than 20 publishers. It has organised many book exhibitions and fairs as well as more than 100 cultural and book signing events, attracting leading domestic and foreign publishers, distributors and agencies. “Book exhibitions and festivals on the street attract about 6,000 visitors per day and 10,000 at weekends and holidays,” said Lê Hoàng, director of the Book Street Company.